Faced with the great interference of El Niño–Southern Oscillation (ENSO) into the local climate of a given site in conjunction with agricultural systems, the current study aimed at assessing the effects of ENSO on thermal and water regimes at different Brazilian sites, as well as its impacts on sugarcane crop yield. The DSSAT CSM-CANEGRO model, parameterized under the Brazilian environmental conditions, was used to simulate sugarcane yield at four sites of different Brazilian states from 1979 to 2010 for three types of soils and two types of simulations, Seasonal and Sequence. The outcomes obtained herein pointed out that ENSO events distinctly impinged upon meteorological variables regime; however, a clear trend as to the air temperature, global solar radiation and rainfall regimes could not be noticed owing to a large variability found in the current study. 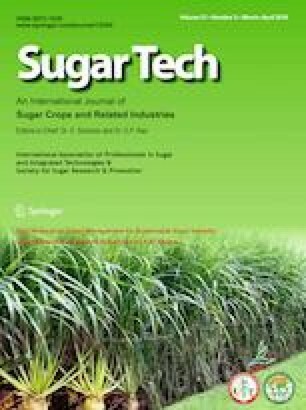 With regard to sugarcane yield, some trends were observed. In Jataí, GO, no changes greater than ± 1 t ha−1 occurred. In João Pessoa, PB, there was a trend of lower yields during El Niño and La Niña years and higher yields during neutral years. Moreover, a contrasting scenario was envisioned in Piracicaba, SP, and Londrina, PR, where yields tended to be higher than historical average under both El Niño and La Niña events, while during neutral years, yield tended to be smaller than average. ENSO Air temperature Global solar radiation Rainfall Yield Saccharum officinarum L.
The online version of this article ( https://doi.org/10.1007/s12355-019-00725-w) contains supplementary material, which is available to authorized users. Authors are very grateful to the Coordenação de Aperfeiçoamento de Pessoal de Nível Superior (CAPES) for some funds provided, as well as to the National Institute of Meteorology (INMET) and National Agency of Water (ANA) for the concession of weather data that made this study possible. Special thanks are also devoted to the Conselho Nacional de Desenvolvimento Científico e Tecnológico (CNPq), Brazil, for the productivity fellowship in research bestowed to the first author of the current manuscript. PCS and ABP were both responsible for designing the study, preparing the dataset, analyzing the data, discussing the results and writing the manuscript. FAOSTAT. 2019. Statistical Database of Food and Agriculture Organization of the United Nations (FAO). http://faostat.fao.org/site/291/default.aspx. Accessed 02 February 2019. IBGE. 2019. Automatic Data Assessement (SIDRA). Brazilian Institute of Geography and Statistics (IBGE), Brasília, Brazil. https://www.sidra.ibge.gov.br/. Accessed 02 February 2019. Lopes-Assad, M.L., R.S. Boschi, E. Nomura, B.A. Evangelista, and J.S.V. Silva. 2007. Soil information to improve the Brazilian agricultural zoning of climatic risks. Congresso Brasileiro de Agrometeorologia, 15, Aracaju, Brazil. https://www.alice.cnptia.embrapa.br/alice/bitstream/doc/8309/1/PLUsoLopesAssad2007.pdf. NOAA. 2018. Cold and Warm Episodes by Season. Climate Prediction Center—National Oceanic and Atmospheric Administration (NOAA). http://origin.cpc.ncep.noaa.gov/products/analysis_monitoring/ensostuff/ONI_v5.php. Accessed 10 July 2018. Nóbrega, R.S., J.A.P. Araújo, A.C. Paiva Neto, E.C.S. Mello, D.B. Soares, F.A.M. Saraiva, and W.M. Souza. 2000. O Fenômeno El-Niño e a influência conjunta do dipolo do Atlântico no Estado do Ceará. Congresso Brasileiro de Meteorologia, 11. Rio de Janeiro, Brazil. http://www.cbmet.org.br/cbm-files/12-3697e0146880af836b2e7e468e5fcb41.pdf. Oliveira, G.O., and P.O. Satyamurty. 1998. El Niño de 1997/98: Evolução e Impactos no Brasil. Congresso Brasileiro de Meteorologia, 10. Brasília, Brazil. http://mtc-m16b.sid.inpe.br/col/sid.inpe.br/iris@1915/2005/03.21.18.30/doc/Oliveira_O%20El%20nino%20de%201997_98.pdf.